Moose Madness 3 is divided into eight sections. 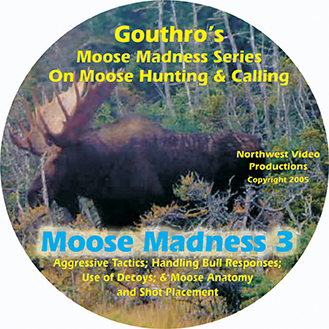 This DVD first teaches the aggressive techniques used by the experts when calling and/or responding to answers from bull moose -- where the caller mimics the bull moose in rut. It then gives an in-depth look at the various types of bull responses one can expect during the moose rut -- and how to handle the various types of these bull responses when hunting or filming. As in Moose Madness 2, there are many Moose Madness 3 'Tips' to help build on the viewer's knowledge, and the chapters on the 'Use Of Decoys' and 'Anatomy & Shot Placement' are invaluable for both novice and experienced moose hunters.